Greetings from a muggy hot day in South Texas. I am hoping for 4 inches of rain – someday! Things have been extremely hectic here so my quilting has been put on the back burner. Before a family emergency hit us on Tuesday, I was still working on perfecting Block 1 of the Austen Family Quilt by Barbara Brackman. I am doing mine in 6″ blocks and Block 1 was driving me absolutely nuts! On Monday and Tuesday I finally had the light bulb come on. I downloaded the templates from EQ7 and grabbed my Marti Michell template packages (I have almost all of them) and found that I had her templates that would fit this block. I started over again and before the emergency call came in I had a section of the block sewn and IT WORKED! I am back in my Quilting Studio unwinding from the stressful week, and today I put the block together!!! I have not worked on many 6″ blocks (well I remember when I worked on my Storm at Sea and wanted to give up but did not) so this is wonderful practice for me. Here is the new block, and from now on when I am working with small blocks, I will go to Marti’s templates! My 4th try on the Block – Success! There is one little problem with this block – can you pick it out?????????? I will not correct it as I was trying for perfection of the 6 1/2″ unfinished block and that was achieved! In fact, I think I like the way I did this one! 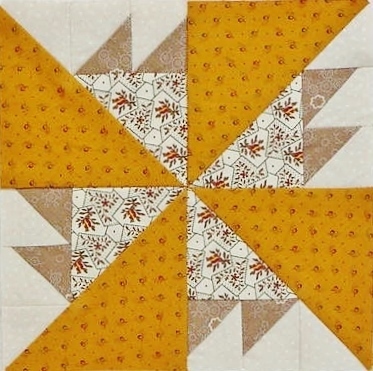 I have now downloaded my April block for the BB 2014 Mystery Quilt, have 2 blocks to make for the Austen quilt, and select some fabrics for Lucy Austen. I am sure that I will need some hand work projects to work on in the near future and will have the time. I will post the other blocks as I finish them. Until then, have a blessed week-end. This entry was posted in Uncategorized and tagged Austen Family Quilt; Marti Michell templates. Bookmark the permalink. ← Ms Austen, EQ7, Frustration and them Perfection! I can’t see any mistake–looks great to me! Thx, The points are not going in the same way that the pattern indicates! I looked at that and said – well this time the Type A idiot will just pass it up LOL.